There isn’t much that beats a barbecue. That classic grill smell on a hot (ok, warm-ish if you’re in the UK) summer’s day with a cold drink in hand is absolutely wonderful. The combination of charcoal and wood chips gives such a unique flavour to food, which is why many consider charcoal to be the best kind of barbecues. It can be a little tricky to know where to start though. These grills are pretty uncomplicated in principle, but there is a surprising variety among them. To help you figure out your indirect grills from your smokers, let us guide you through the very best selection of charcoal barbecues for your best summer cooking. Which Charcoal BBQ should I go for? How much do you need to cook? What kind of barbecuing are you doing? If a large barbecue is among your requirements, then the Biloxi Offset should be high up on your list. It comes equipped with a generously proportioned cooking surface, with a warming rack at the back of the grill. One big feature is the fairly large smoker unit attached to the side. For ‘low & slow’ cooking; keeping big joints of meat at a low temperature for a long time; this is ideal. The cooking grids are also enamel-coated, with great longevity and heat retention for that perfect sear. Some other good features come courtesy of the handle on the smoker box and the wheels, built from tough steel to match the rest of the barbecue. Said steel housing is coated in a heat-resistant finish, which can withstand temperatures of up to 350°C – the built-in thermometer also ensures you can keep a close eye on heat. This all-in-one smoker from Callow packs versatile features into a relatively compact unit. With space for a water/charcoal pan, for cooking/smoking, as well as 2 cooking grids and hooks for smoking fish, sausages and more, this has a lot to offer. The pans are easily accessed and topped up. Thanks to the barrel shape of the barbecue, the 1-gallon capacity of the water pan is enough for 2-3 hours of cooking or 5-6 hours of smoking. The powder-coated carbon-steel body is tough and plenty heat resistant, with convenient vents/access points to allow ventilation and access to temperature probes. It also features a built-in thermometer on the lid and comes apart easily thanks to stainless-steel clasps that hold it together. The name really does say it all. The Callow XXL’s huge cooking surface gives you a tremendous amount of space for your grilling needs, with an equally generous warming rack on the back. The foldable side shelves, complete with utensil hooks and even a bottle opener, maximise the usable surface area as well. You’re offered lots of control over the cooking temperature thanks to the height-adjustable charcoal tray beneath the grill surface. Accessible from the front, you have 6 heights to choose from, as well as naturally easy access and cleaning. The powder-coated lid helps keep the cooking heat in, which you can check from the thermometer. It’s also straightforward to manoeuvre with wheels and stainless-steel handles. 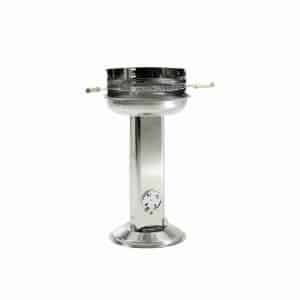 Sitting at a lower price point, but with quality far exceeding that price, the stylish Landmann Pedestal is a superb compact grill. The main body is built from tough stainless-steel, but has a chromed finish which gives it a lovely modern look. It’s also height-adjustable, a neat feature that keeps it versatile. The chrome-plated grill surface is still large enough to cook comfortably for 4, and the rear of the grill has a useful windshield to offer some protection to your flames. The ash catcher sitting below the grill is also super simple to remove and clean, and there’s a small ventilation disc to allow you to regulate the heat of the barbecue. 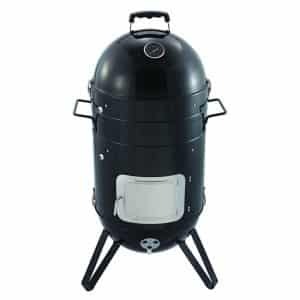 The Outdoor Smoker from CosmoGrill is a great choice for charcoal barbecues, with ample grill space and a smoker cabinet situated beneath the cooking surface. Claiming enough capacity to fit almost 3kg of charcoal briquettes and over 1 kilo of coal, you can be sure that this will retain its heat adequately for long cooks – the adjustable crank handle gives you some control over the coal height as well. It’s very hard to go wrong with this – it knows what it needs to do and does so with minimal fuss and complications. The grill surface itself is in 2 parts, allowing for much easier cleaning, while the full-width warming rack comes as 1 single part. The 2-part grill surface means that coals can be added to one side, perfect if you are cooking indirectly. The classic functional design and compact shape of the Landmann Kettle make for a straightforward barbecue experience. Owing to its travel-friendly size and shape as well as sturdy wheels, this is a go-anywhere unit that would be at home in the garden, on the beach, even in the park. Carrying it around is also straightforward, thanks to sturdy side handles. Easily capable of cooking for small gatherings, it’s very simple to use. The charcoal bowl and lid have an enamelled finish for heat resistance. They also feature a couple of ventilation discs to give you some control over the heat, and the removable ash tray ensures simple cleaning. 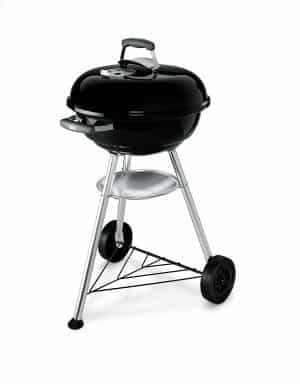 The mid-range Charcoal BBQ from Toronto is a well-built, functional barbecue. Offering a decent amount of cooking surface and accompanying warming rack, and not taking up too much space as an entire unit, it’s a solid performer. The metal build is complemented by an enamel cooking grid, which holds heat well and is easy to clean, and has a neat circular cutout section. Good for adding extra charcoal, and even enough room for things like woks. Adding to its usability is the adjustable charcoal tray, which gives you freedom of control over the temperature with the supplied crank handle. Add to that the handles on the side and lid, as well as wheels, for straightforward maneuverability and you’ve got a user-friendly package. The foldable side shelf is a nice touch as well, giving you a bit of extra preparation and food storage space. When it comes to the absolute classic aesthetic, the Landmann DIY is perfect. 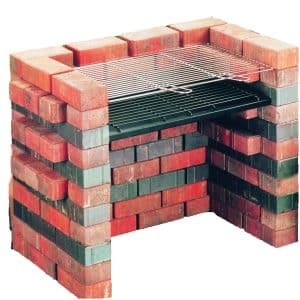 Although it doesn’t ship with the pictured bricks, you can easily create a rustic cooking area in your back garden thanks to detailed instructions on how to do just that. 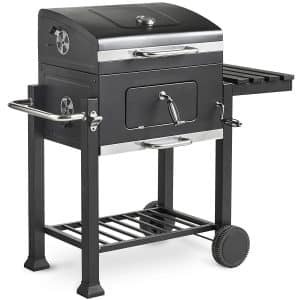 The supplied chrome-plated grill surface is plenty big enough for all the family, and a grid for the charcoal as well as an ash-catching tray are included. Build it to the manufacturer’s instructions and you’ll also be able to adjust the charcoal tray height between two levels. The design of the trays allows for simple removal and cleaning, making this a very no-nonsense approach and barbecue solution. Designed to be simple, sturdy and effective, it’s hard to go wrong with this one, as long as you’re at home with some simple building work to begin with. This large-sized barbecue unit is the perfect solution for catering to a crowd. Whether you’re cooking for a garden get-together or a bigger party, the ample proportions of the grill surface have you covered. A big double-level grill for indirect cooking, a warming rack as well as a foldable shelf to the side and trolley shelf underneath give you all the room needed for storage, preparation and cooking. 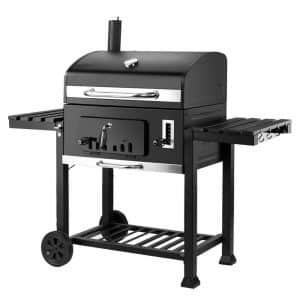 The powder-coated steel build ensures a long life that’s resistant to the wear and tear of a grill in regular use. You’ve also got a charcoal tray with adjustable height, courtesy of the crank handle, as well as a dedicated wood chip tray. Therefore, this is not just a barbecue, but can be converted into a full-on smoker unit – adjustable ventilation discs help you keep on top of it too. Don’t let its size fool you – the Compact from Weber is a classically-shaped kettle barbecue with impeccable build quality and usability. It proves that this particular style of grill is not always the cheap and cheerful option; built from high quality coated steel to keep heat in, and an easy-clean chromed-steel grill surface for great cooking, this is not simply a barbecue you use for one summer and replace the next. It has a large grill surface despite the compact build and is designed with the user in mind. The grill itself has handles for removal and cleaning purposes, and the lid (complete with handy ventilation disc) can be hung on the side of the unit. The ash tray is easily accessible for emptying, so all-in-all the Weber Compact does a very good job. The traditional barrel-shape of the Azuma Barrel is a heavy-duty solution to your barbecuing needs. An uncomplicated but strong performer, this takes a simple approach to grilling and does it well. The steel barrel body provides plenty of room to cook a party’s worth of food, with ample room for coals beneath the grill and a warming rack for what’s already done. Several well-placed ventilation discs on either side of the body give you a simple solution to temperature and airflow control, allowing you to double it up as a smoker as well. Add to that the full-width front shelf with plenty of room for preparation, utensils and the like, and you’ve got a great piece of kit. 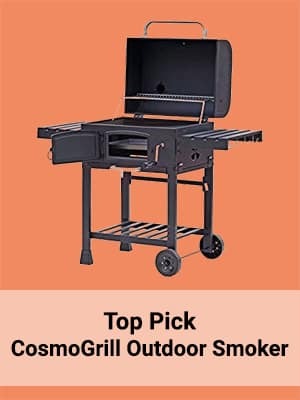 Best quality & features – The Outdoor Smoker from CosmoGrill stands above the rest as having the best set of features at a high quality. For one, the dimensions of the grill make it a sure-fire choice for serious barbecue cooks, with easily enough room to cook for a party and keep it warm while you make more. On top of that, the easily adjustable charcoal tray gives you deft control over temperature, aided by the built-in thermometer. The versatility of the unit also contributes to its recommendation. If you’re trying to smoke, there’s room for you to put wood chips down and impart some extra flavour to your food. If you’re a fan of indirect cooking, the two-part grill surface can handle that too. 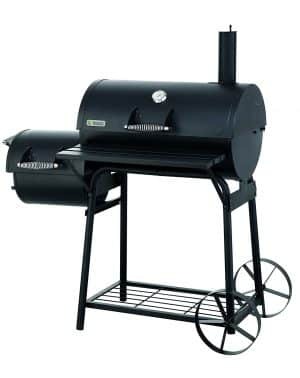 Ultimately, the Outdoor Smoker has plenty of features and a great build quality to make it a great investment. 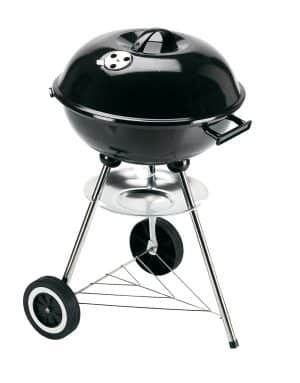 On a budget – Landmann’s Kettle Charcoal Barbecue is a mix of quality features and a solid build on a budget. More than capable of meeting the cooking needs of the amateur barbecue chef, it’s hard to look past. 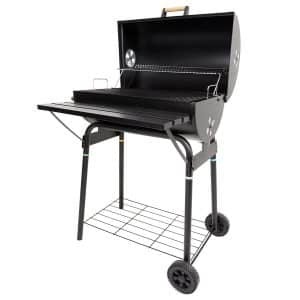 Making sure to make the most of its low price point, the unit is enamel-coated for decent durability and heat retention and the chromed cooking grill heats up and cleans well. It utilises user-friendly features like an accessible ash tray and tough wheels as well, meaning it’s great for travelling and impromptu barbecues. For the traditionalist – The Landmann DIY is a great choice for those of you who want to go just that little bit further in making your barbecue yours. The grill set itself is simple and functional; it’s grilling at its purest form, but with the added project of building the pit into which your barbecue sits. So, if the satisfaction of DIY projects appeals to you, then look no further. 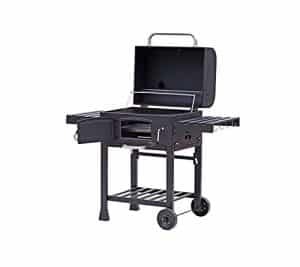 For trying new techniques – The Tepro 1087 Biloxi Offset is a great all-round barbecue, particularly if you’re exploring new cooking techniques. Primarily thanks to the offset smoker cabinet, it gives you the freedom to give these new methods of barbecue cooking a go with ease and without too heavy an investment. For absolute versatility – Callow’s Charcoal Smoker packs a remarkable amount into a fairly small package. With the capacity to grill over charcoal and wood chips, a water tray for steam cooking, 2 levels for your grill surface and add-ons like hooks (and the accompanying rack), you’re almost spoilt for choice with just how many different things you’re capable of doing with the Callow. Best for travel – The Weber Compact Charcoal BBQ is a great option for the road-trip-minded among you, or simply those that like the odd beach or park grill-up. It’s fairly small, although still plenty big enough for a handful of people, so should go into a car with relative ease. It takes minimal set-up and cleans away simply when you’re done. It’s definitely worth the slightly bigger investment, as the sturdier build quality means it will survive more than its fair share of adventures. A charcoal barbecue is a great choice if you want to grill and work on adding some traditional ‘BBQ’ smoky flavours into your cooking. With a fair variety to choose from, it can nonetheless be a confusing task to choose. The more practical considerations are of course necessary; how much do you regularly need to cook? Is your choice tough enough for the rigours of regular grilling? How straightforward is it to look after? But when it comes to charcoal-fired barbecues, there’s that whole world of different cooking styles you can begin to explore too. With that in mind, let our reviews and buying guide give you a helping hand into making the best choice for your needs. This depends on whether your barbecue endeavours are family-oriented, party-oriented, just-a-couple-of-people-oriented; the list goes on. Naturally, the more people you need to cook for, the bigger the grill you need. There is a second consideration for size though, and that is the physical size of what you’re cooking. If your preference is mainly burgers, steaks, sausages (and vegetables of course), then they don’t take up as much room as, say, entire racks of ribs or whole chickens. In the cases of larger hunks of meat, make sure you’ve got enough space to sit them comfortably on the grill. There’s also indirect cooking to consider. If that’s something you’re trying you need one side of the grill for charcoal and the other for cooking space. The art of barbecue is not as simple as putting food onto a hot grill, waiting a while and turning it occasionally. As touched upon in the ‘how much’ section above, you might be inclined to cook some bigger pieces of food, such as ribs, shoulders, whole birds and so on. But this is more than just a space consideration. If you’re interested in smoking foods, then you have another consideration to make. While the smoking in itself is down to factors like wood chips used, you may find it’s necessary to have a smoker box offset to the main unit, or simply somewhere to put those chips. Indirect cooking is another element to consider with some of these. 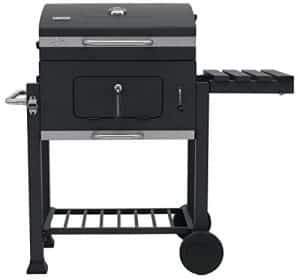 Depending on the build of the unit itself, or if the grill surface comes in 2 parts, you are sometimes able to lay coals on one side whilst laying food to the other side. Food, therefore, cooks via indirect heat, instead of from the open flame, giving you flexibility with wood chips for that smoky flavour as well as a generally lower temperature. Ash, from the burning of charcoal, is undoubtedly a pain to clean. Make sure to check that the grill you’re buying has some kind of ash tray or at least a mechanism to help get rid of it more easily. Because without that, your main option for getting rid of ash is picking up that grill, turning it upside down and tipping out the contents. Let’s face it, you don’t want to have to do that. The material of the cooking grid itself counts too. Some lend themselves to easier cleaning than others; for instance, stainless-steel is a different consideration for cleaning than a cast-iron or enamel grid, so take this into account when purchasing. Looking at the durability of a charcoal barbecue addresses a few areas. The obvious thought is the main build material – many feature a pretty solid stainless-steel construction which has a well-renowned longevity. Of course, there are degrees of quality within this. 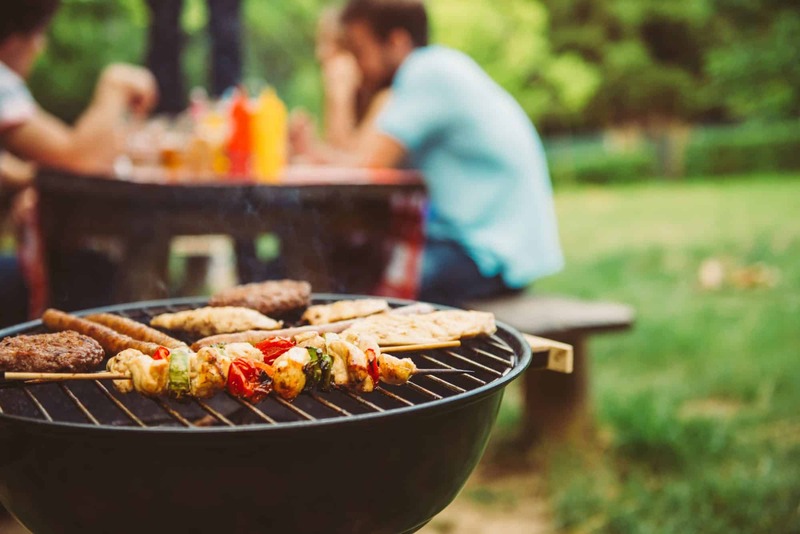 So if you see yourself using your barbecue for a number of years then it may be beneficial to spend a little more on that initial investment on a thicker-walled unit. The cooking grid is also something to think about in terms of lifespan. Cast-iron and enamelled grids do tend to last longer with proper maintenance; cleaning, seasoning etc; but are inherently more fragile than their stainless-steel counterparts. Heat control is a cornerstone of effective charcoal grilling. Different barbecues will have venting systems to give you easier temperature regulation while some have simple thermometers to give you a simpler visual tracking system. Adjustable charcoal trays is another feature that is specified on some models too, which again allows you a little more of a say in regulating temperature. So that’s our comprehensive round-up of the best charcoal barbecues available for you to buy, just in time for the British summer. Now you know your in directs from your smokers, all the information you need to make the most informed choice you can is right here. Happy grilling!